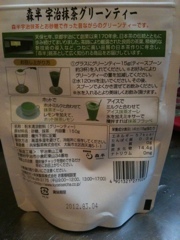 So a couple of my friends have been asking me what kind of green tea powder I’m using in my smoothies. 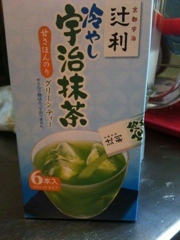 I used sweetened matcha powder, which is Really easy to come by in Japan. They sell it in your local conbini (convenience store). In the states, or other countries if you go to your local asian food market they should have it. Here are a couple photos of the kind of powder I use. front and back. You can see on the back you can mix it with water or milk. This one says 甘さ。。。which means sweet. 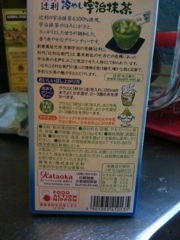 On the back of this package it also says to mix with milk or water. 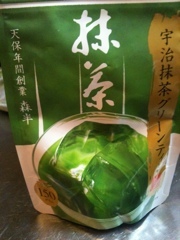 You can also make a topping for shaved ice which is a popular summer treat over here.